Arsenals of Folly picks up where The Horrid Pit (which we looked at a while ago) left off: let the photograph do its work, and recognize when less is more. 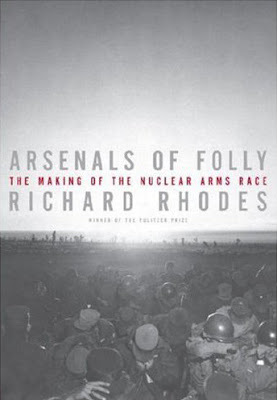 There's tension in the cover of Arsenals of Folly: just how long *does* it take a mushroom cloud to form? I had reservations about The Horrid Pit when first you posted it, and now i am delighted to find Arsenals of Folly doing what I had wished the former had done. Instead of aftermath, we are instantly involved in the tension of the action about to happen. The typography does what it needs to without getting the way. Great cover. Horrid Pit is crap design. The subtitle is so close to the trim! Arsenals takes that theme and makes it look more professional. I agree that the type on "The Horrid Pit" is far to close to the trim, however, I feel that the color and type selection are more interesting. The image for "Arsenals of Folly" doesn't have any blacks (it's a fairly flat image) and the type has no emotion to it. 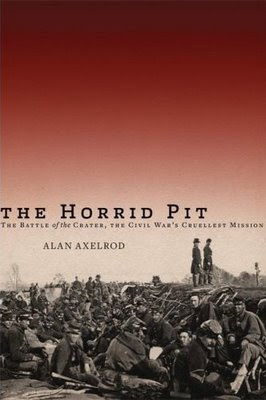 I find much more depth and interest in "The Horrid Pit". "oh, we're doing a book on some war—lets use an image from the war..."
I dunno, maybe it's the only way to go. Sorry, poorly phrased on my part. What I mean is that I love the restraint both designers show in not feeling compelled to fill the sky with type. I love this site but find it a bit tedious making a comment - too many steps. Any way we could leave comments on same page as the cover appears? Yes, the comment system is less than ideal. A redesign in 2008 might be in order. Don't know if the book covers this, but knowing the history of the photograph on the cover of "Arsenals of Folly" helps. In the 1950s, the US Army ordered troops to observe above-ground nuclear detonations at various distances, then conduct exercises at or near the blast site right after detonation. This explains the troops in the photo. You can probably imagine what happened to all of them in the next decade or so. You can find this photo and more like it in Michael Light's "100 Suns". Wow, amazing how similar the two are! I hate the saturation of the red and the typography on The Horrid Pit though. Ya know, this is funny. I first saw the ARSENALS cover when walking through the Knopf editorial dept. I thought, "hey, that's kind of like HORRID PIT." I designed HP. Crap or not, I was amazed it was printed, especially without a blurb. And for what it's worth, the subtitle does not reach the trim on the jacket. Must've been cut short for online accounts. Jonathan, thanks for commenting. For all I know, I cropped the JPG and the resulting tightness is my fault. If so, my bad. If it really bothers anyone, go to the bookstore and see it for yourself, or better yet, buy the book and support the author. And by extension the designer. I am only seeing the two covers here on my screen for the first time. I would pick up the Horrid Pit on the theory of "good design probably equals good book"
At least as far as a web image your design is much more effective. I like the coloring; I like the typography and tying the type layout into the focus of the photograph. I also like the fact that on this image the subtitle fills the width of the photo image area.